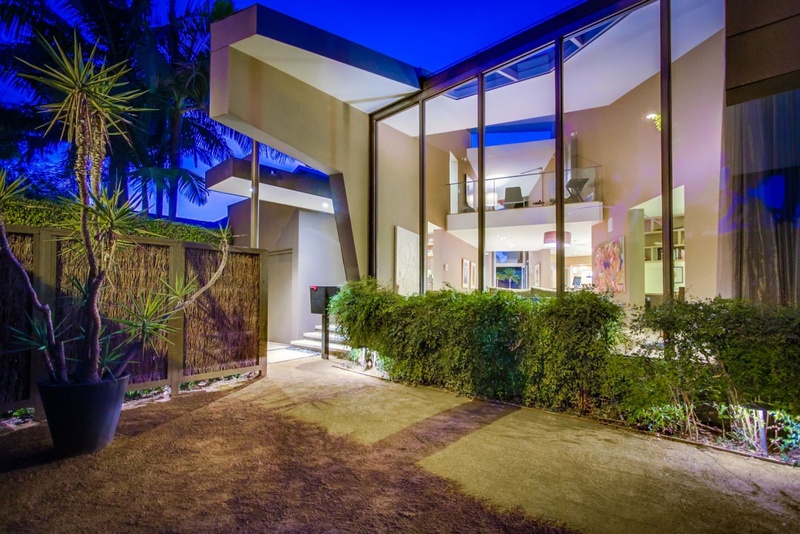 This sleekly designed home by well-known architect Patrick Tighe, AIA, rebuilt in 2005 is located in one of the best parts of West Hollywood. Step inside and the open floor plan immediately unfolds warmly with its' wheat colored bamboo flooring, soaring ceilings and 2 story sun filled living area; an entertainer's dream! The impeccable cook's kitchen has custom cabinetry surrounding a luminous center island and is surely where all your guests will gather. Although modern and minimal in style, this home is very welcoming and provides a peaceful retreat for busy professionals. The property incorporates 2 bedrooms, one a master suite, 2 baths, a separate office space on its 1st floor, and a floating mezzanine den/media space above. Light pours in from every angle through the many oversized windows. Follow your eye towards the back of the home where the expansive glass doors beckon you out to the pool area with its beautiful landscaping, a custom designed pool with waterfall, built in barbeque, and prep area. Walking distance to many world class shops, restaurants, and all that West Hollywood has to offer. When home on the weekends, there will be little need for a car.